Branson log cabins are some of the most popular accommodations that you can find at Thousand Hills Golf Resort at the Grand Mountains. These lodging venues are beautifully located in a rustic wooded setting around the Ozark mountains. Branson log cabins provide guests luxury and comfortable living but with affordable price. These great accommodations at Thousand Hills Golf Resort have great features of modern amenities such as wireless internet access, cable TV with HBO, and a DVD player. These cabins feature fully furnished-kitchen which include high-end appliances such as fridge, microwave oven, dishwasher, washer/dryer, pots and pans, and kitchen wares and utensils. The great location of Branson log cabins at the Grand Mountain is a perfect place to spend a wonderful vacation with the whole family as it’s in this place where you can enjoy a relaxing atmosphere in a calm environment. The place is also located in a secluded place where beautiful wildlife, pristine scenery, unspoiled nature, and the clean and crystal clear waters of the lake are easily accessible. As these cozy accommodations are located near the golf course, you can easily have the chance to play with Branson’s most popular 18-hole golf course. Tucked into the heart of Branson yet beautifully nestled in a secluded area, these log cabins at the Grand Mountain offer both convenience and easy accessibility to many exciting attractions. These comfy log cabin accommodations feature elegant amenities such as tiled countertops, wood flooring, stone fireplaces, excellent beddings and Jacuzzi tubs that are sure to pamper every guest. Other features of these great cabin accommodations include tile and marble baths, walk-in closets, and open porch overlooking beautiful sunsets over the Ozark Mountains. After a relaxing day in your cozy cabin accommodation, it’s time for you to enjoy outside by watching live entertainment shows, visiting museums and shopping malls, all these are easily accessible from your accommodation. In the wooded location in central Branson, the luxurious log cabins at Grand Mountain are available in a variety of styles and sizes. Some log cabins feature intimate setting for romantic couples, to large two-bedroom to three-bedroom cabins that sleep up to eight guests. All of these log cabins feature living room, dining room and private front or back porch. These cozy log cabins also feature a variety of beautiful designs and floor plans, from modest to all out luxury. These great accommodations at the Grand Mountain are dream come true for log lovers. These log cabin accommodations are also perfect for homesteaders and vacationers but they’re becoming a favorite choice for businessmen looking to invest on the booming tourism market. 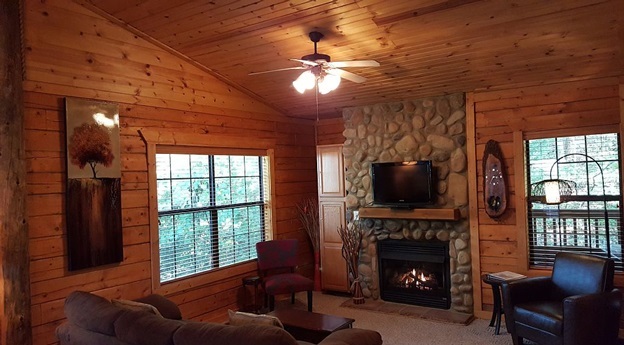 Whether you’re looking for a home to live or as a vacation getaway, the log cabins at Grand Mountains are a great place to consider if you’re on the hunt for a luxury accommodation in Branson. So, if you want to spend a relaxing and pleasant vacation in a secluded place, be sure to stay at some of the best log cabin accommodations of Thousand Hills Golf Resort in Branson.